This is a simple group game for practising counting on and back by tens and ones. I used our recently-purchased pocket cubes to create dice for the game. Players sit in a circle and takes turns to roll the dice and count as instructed. 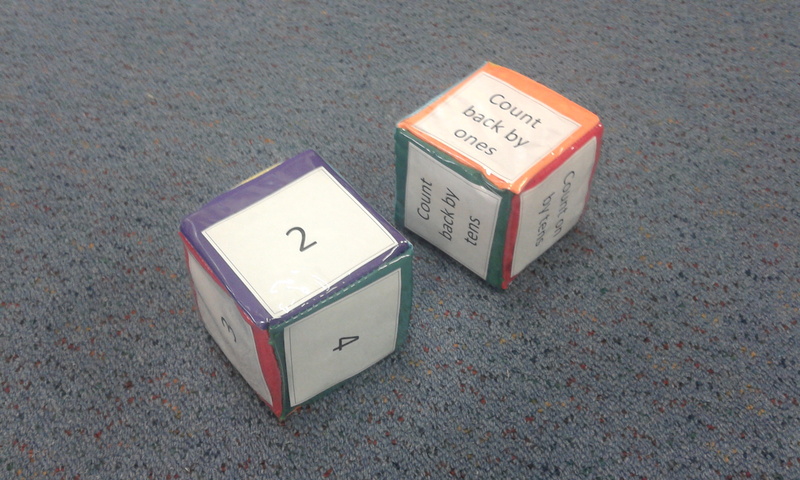 The worded die tells you whether to count on or back, and by ones or tens. The number die tells you how many numbers you need to count. Play starts at 100. Player 1 rolls "count on by tens" and "3", so they count "110, 120, 130". Player 2 counts from 130. They roll "count back by ones" and "4", so they count "129, 128, 127, 126". If you get to or below zero, restart at 100. I have a roll call class called "Peer Numeracy", which involves a group of year 8 students who need help with numeracy working with year 10 students as mentors/leaders/tutors. We tried this game today in our first session for the year. They played in groups of 3 or 4 and the student leaders helped them mostly by remembering what number they were at, and providing guidance where it was needed to keep track of their counting. Does anyone else use these pocket cubes? What have you done with them?